Las Vegas is home to some of the top PGA golf professionals, instructors, and schools in the country. We have teamed up with a select few of the great pros in Las Vegas to provide our clients with the ability to get anything from quick tune up to a multi-day intensive training camp. With VIP Golf Services, you will improve your game and learn some great techniques that will last you a lifetime. Below you will find a showcase of some of the great instructors we work with. Each offer something a little different and unique. Everything from a quick 1 hour lesson, 9 or 18-hole playing lessons, computerized swing analysis and instruction, indoor and outdoor facilities, group lessons and clinics, to club fitting and more. Give us a call toll free at (877) 669-2847 to discuss your needs. The Bob May Golf Academy has over 45 years of professional golf experience and 50 years of teaching experience, including playing the PGA, European, Asian, Japanese, Australian and Web.com Tours. Their goal is to make the game of golf more enjoyable for everyone. The academy’s focus reaches out to a full range of players from the high-handicap golfer to those with aspirations to play competitive golf. There are a variety of Butch Harmon School of Golf school packages available, but all have one very important thing in common: You will receive high-level instruction from a Team Butch Harmon staff member learning what the best golfers in the world have discovered by working with the staff of the Number One Golf Instructor in the world. This is the same facility where world renowned golfers such as Tiger Woods, Phil Mickelson, Adam Scott, Rickie Fowler, and more have all fine tuned their game. Using his time-tested approach to instruction that spans more than three decades of success, Butch and his high-level staff can show you how to refine the game through individual personalized attention. With a small teacher-to-student ratio per class, you will receive focused attention on the unique needs of your particular swing. Gaylord Rhodes the “Vegas Golf Coach” has over 30 years experience as a Golf Professional dedicating 26 of those years to educating, coaching and teaching professionals and amateurs all over the US. 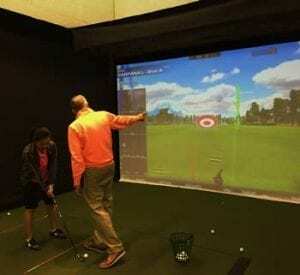 The new Indoor Golf Center is outfitted with two of the latest aboutGolf Simulators featuring the highest level of technology available today including high speed cameras, aG balance weight transfer analysis and the aG 3Trak launch monitors as seen on the Golf Channel. This facility will allow you access to the most complete indoor golfing experience in Las Vegas. You are able to play on one of over 50 championship courses. Come in to practice your entire game, take one of the coaching/teaching sessions or experience a complete equipment evaluation using the launch monitors.